BSG combines unmatched technical expertise with the highest standards for privacy and discretion, working with dynamic and sophisticated clients including billionaires, entrepreneurs, investment managers, athletes, artists and entertainers. Blue Sky Group’s team of industry leading professionals are led by Harlan Hallett and Chris King. With a combined experience in the professional services industry, our team has come together to share our knowledge, contacts and experience allowing us to provide the best advice and strategies for a select and targeted clientele. 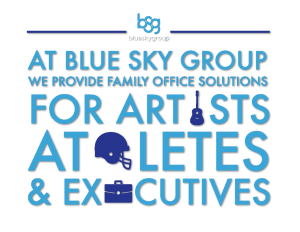 At Blue Sky Group, we provide family office solutions for Artists, Athletes, and Executives. Blue Sky Group’s team of industry leading professionals are led by Harlan Hallett. With a combined experience in the professional services industry, our team has come together to share our knowledge, contacts and experience allowing us to provide the best advice and strategies for a select and targeted clientele. Musicians require custom financial strategies to accommodate irregular cash flows from royalties, publishing deals, and touring income. Additionally, a transition plan is critical when preparing for a catalog sale or life after performing. Having an understanding of the challenges that musicians and songwriters face financially allow us to be a great addition to their team. Our team works in conjunction with their managers, attorneys, booking agents, and other team members to ensure a true cohesive financial plan is in place at any given time. We want our clients to focus their time on their passion and families. Our team has experience developing solutions to help these clients make solid decisions. Professional Athletes’ careers can be short in length; therefore, a sound long-term plan preparing the athlete for the next phase is critical. Managing bonuses, understanding player benefit programs, and reviewing contract terms are all necessary steps to develop a plan. Since most athletes get large sums of income early in their careers, we focus on risk management, with a belief that the best offense is a good defense. We act as the financial quarterback, making sure that our clients’ estate, tax, insurance, and investment plans are effective. By working closely with their agents, bankers, and attorneys, our team makes sure everyone is performing at the highest level. Corporate Executives can be busy trying to balance demanding work schedules, travel, and family time. Evaluating long-term benefits is vital to making a transition towards retirement. Our team realizes that balance in life is important, and to obtain this balance there must be processes in place to manage your assets. We help to provide the discipline needed to succeed, and have the experience to provide solutions to this group of clientele. Let our team help you develop and implement a detailed investment, tax, estate, and insurance plan that meets your needs. Blue Sky Group solutions are delivered by an award-winning team of family office, accounting, tax, business and wealth management professionals, supported by state-of-the-art-systems and technology. When a creative professional’s activity becomes significant enough to warrant a business manager, allowing a business manager to take care of the stress of dealing with the payment of day-to-day bills and long term financial objectives allows musicians, songwriters, athletes, and actors to spend their time focusing on what they do best – creating. Trust, Wills, and Estate Planning Oversight and Consulting Through All Phases – Initial Planning, Installation of the Plans, etc. Our professionals have extensive consulting experience and a thorough understanding of the changing landscapes in today’s real estate and insurance marketplaces. We are able to help our clients make better insurance and real estate decisions by offering services in all legal aspects relating to the conveyance of real property including financing, drafting of contracts, resolution of complex title issues, development, zoning and land use. Blue Sky Group is one of the few business management firms able to offer touring artists an accountant to oversee all of their tour finances. By keeping a detailed record of all expenses and transactions that occur on tour, our clients can be confident we will provide them accurate financial oversight. Fill out the contact form below or speak to one of our team members on the phone, and see how Blue Sky Group can help you.